We have all heard about the fast-paced lifestyle. With so many things to do and so little time, we zip through the highways. We wolf down our meals. We hurry our kids. In a world where every second seems to matter, we easily grow impatient with incompetence. We become frustrated when the driver in front of us cruises at the posted speed limit. We wonder why the bank teller can chat so casually with the customer she was serving even when the line is long. What if we allow this kind of crazy speed through life to enter our relationship? What if in our rush to get things done, we push others to travel at our expected speed instead of their natural pace? Ever heard about how a twenty-year old young man pushed over an eighty year old lady just to reach the cashier first? Or how this cartoon urges us to "Stay in Queue" even when the line in front of us does not appear to be moving. The story of Martha and Mary demonstrates how the busyness of activities can mess up our sense of priorities. Good works are noble tasks, but when we try to force people to pander to our expectations, the nobility quickly evaporates. Work first, pray later. Get things done first, leave people alone. Move first, love later. Even in the presence of our Lord Jesus. I like things done fast. I also like them to be done well. At the restaurant, after placing an order, I would expect my food to arrive within 15 minutes. Twenty-five minutes would push me toward an intolerable level. By forty-five minutes, I would be ready to walk out. Unless, of course, the restaurant is highly popular, and the food was worth waiting for. I know of certain restaurants that people would be prepared to wait for hours. In such a situation, the quality of the food makes the quantity of wait time more bearable. For if we give up our positions in the queue, it would be happily taken over by the next person in line. With Chinese New Year fast approaching, I remember the famous BBQ meat in Chinatown that is so popular that customers had to queue for hours just to buy a pound of delicacy. It marvels me that even in a busy city, people would patiently wait for quality food. These people who can bear the wait are those who know that the food is worth waiting for. I never really knew how Mary would know Jesus was worth waiting for. Who told her? What did she see that Martha failed to see? How did she choose what was better? I believe she knew her priority. She was a "first things first" person. She could distinguish the necessary from the urgent. She knew that good works are important, but good works must never overshadow what is more important. The trouble with Martha is not in her busyness to get things done or to serve the guests promptly and adequately. Her problem is how speed, efficiency, and activism had usurped relationships, life, and love. We can get a lot of things done but often at the expense of relationships. With so many things to do, Martha was distracted with a need to get these many things done. The price was her anger at her own sister. The bigger price was her missing out on what was greater: Enjoying the Presence of Jesus. In "Slow Church," Christopher Smith and John Pattison point us toward God who is patient and who is loving. This patience flows from love. Just like the great chapter of love in 1 Corinthians, we are reminded that "love is patient, and love is kind." Smith and Pattison pointed out two aspects of why people are unable to be as patient and as loving as God. First, it is human rebellion that pushes us out of God's circle of patience, and to demand speed to fulfill human wants. Second, it is a lack of discernment between good and evil. Put together, sin warps spiritual discernment and increases our tendency toward deception. Deceptions such as thinking God needs the Church more than the Church needs God; or to assume that if man does not help himself, God would not lift a finger to help. Perhaps, the biggest deception is self deception. The popular Bible teacher, Warren Wiersbe was reported to have said: "Just remember, you can never franchise the blessings of God." One way that we "franchise" God is to do Church the same we McDonald's is run. George Ritzer of the University of Maryland in 2003 published the four characteristics of McDonaldization: Efficiency, Predictability, Calculability, and Control. Like the fast-food giant that has become synonymous with American efficiency, humanistic predictability, capitalistic calculability, and technological control, the Church too can be guilty of trying to fix structures and programs to exact maximum advantage. In "Efficiency," the Church can try to oversimplify Christian discipleship into a series of steps and programs. Throw in a certain number of resources and to make sure we get a certain number of converts. Do a few spiritual steps and we get a certain spiritual fruit. In "Predictability," we churn our certain program to feed the masses. Go to the "traditional" service and we get our dosage of hymns and oldies but goodies. Go to the "contemporary" service and we get the latest and the greatest songs. In "Calculability," we measure Church health on the basis of numbers. We get excited when the Church is packed, but worry ourselves madly when the numbers dwindle. We call the megachurches as successful. We use popularity of speakers as a spiritual gauge instead of using the Bible as the measurement yardstick. Personally, I know of some of the most biblical speakers sharing to pulpit to only a handful of believers. In a culture that prefers exciting stories instead of "boring" Bible narratives, we miss the forest of truth for the trees of temporal tales. Then, there is "Control" where we use nonhuman technology to do Church. Preachers must preach a certain way to draw in the crowds. Churches must create a right ambience to ensure maximum comfort and minimal distractions each Sunday. Smith and Pattison assert that "nonhuman technology includes not just machines but materials, skills, rules, and regulations - anything that is used to control that greatest source of inefficiency, uncertainty and unpredictability: people." Martha tried to hem Mary in. In her desire to get things done quickly (efficiency), her desire to do the work quickly (predictability), to get Mary to help her (calculability), and to use Jesus to get Mary to help her (control), she eats, breathes, and emanates speed. When she failed to get Mary to do what she wants, she became frustrated. Her sense of priorities got switched. She needed Jesus to remind her once again that she was distracted by many things. In fact, she did not need so many things. 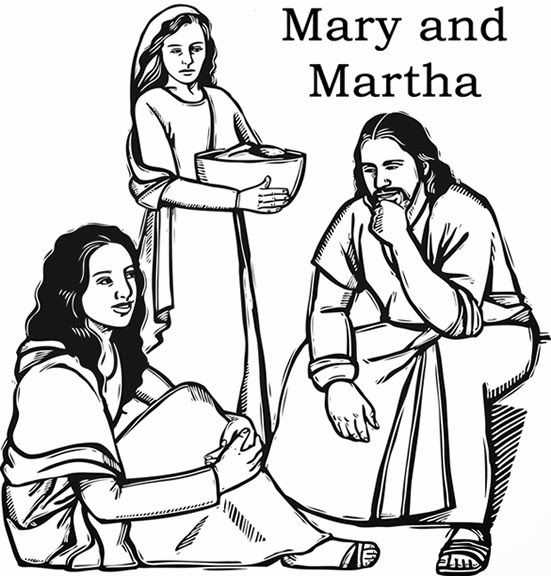 If only one thing was needed for Mary, Jesus was also telling Martha that she needed to cool it, to relax, and not to be so easily worked up over trying to control people. Love speaks louder than speed. 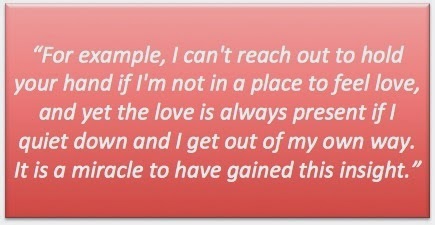 Let me close with an excerpt of a touching letter from Pamela to Rick. When it comes to getting things done, we depend on our own skills, talents, and competences. When it comes to relating with people, we need to let go of our own sense of control, and to let God lead and guide us. That is what love is about. It is about giving, not getting. It is about receiving others as they are, not resorting to controlling others. It is about staying calm to let people be who they are, while we let God show us who we are.